★【Waterproof】 - 98ft waterproof (30M) design make this women ladies girls wrist watch perfect fit for almost all kind of business, casual, indoor activities and daily use. The watch withstands splashes or brief immersion in water, but not suitable for swimming. ★【Precise Time】 - High quality Japanese quartz movement ensure precise time. Water resistant design will make you enjoy yourself even when you are playing water in the summer. ★【Best Gift Choice】 -It will be a nice present for valentine's day, thanksgiving and Christmas, also a good present for friends and families. 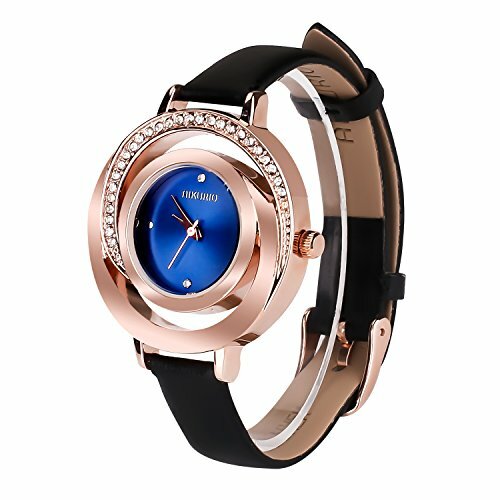 It's a perfect gift watch for women ladies and girls. ★【Guaranty】-We promise a 12-month warranty and 90-day 100% full refund guarantee.Any dissatisfaction, please contact us.